Ashraya was founded by Vasuki Subbarao in 2007. Ashraya runs libraries at 9 Government schools in rural Karnataka, and also runs Science and Arts clubs at 6 of these schools. Ashraya aims to improve the reading ability of the children at these Kannada medium schools, by creating a library room, stocking the library with books at the appropriate reading levels, and monitoring the reading levels of the books borrowed by the children through librarians hired and trained by Ashraya. Ashraya actively work with the Government Block Education Officers and with School administrators to obtain support for these programs. Ashraya aim to actively intervene in the development of the top 10% and bottom 20% of students. The top 10% of students at the libraries participate in a Book of the Month club, and write book reports and keep books for themselves. The bottom 20% of students are coached in reading Kannada through a teacher hired by Ashraya, with two sessions per set of students in a week. Top students also participate in the Science clubs, where they learn, and demonstrate, the basic principles of Science through simple experiments. Students who are interested in, and good at, Art, are coached in Sketching, Coloring, Still Life creation and painting by an artist who works part-time for Ashraya. OPEN board member Rajesh met Vasuki and Jayanthi in 2013, and OPEN funded construction of 3 of the 9 libraries run by Ashraya in 2014. OPEN has been funding the operational expenses for 5 of the libraries and Science and Arts clubs from 2015. Beginning in 2017, Ashraya set up computer clubs in their schools and hired a dedicated computer teacher to teach the basics of MS Windows, file browsing, word processing, and computer art. Click here for a detailed description of the Computer Clubs. Each book in the libraries has a GROWBY reading level. 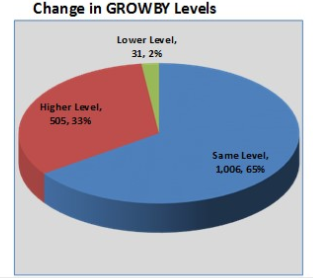 The chart below shows the GROWBY reading level comparison for the children in the year 2015-16, from the start of the academic year to the end. About a third of the children improved their reading ability and two-thirds did not. It points to the need to actively intervene in the children's education, as the existing school system isn't doing the job. Ashraya actively monitor their projects using a project coordinator, and publish metrics, such as the one below, in their annual report. Videos of Ashraya children performing science experiments, and of their Arts classes, can be found on Ashraya's Youtube channel.